You are here: Home / Norwex Products / Dishes / Did You Know Norwex Sells a Dish Mat? I wonder: how many kitchen accessories could you list off that Norwex offers? I think that most Norwex customers are familiar with the kitchen cloths (oh please tell me you know about these kitchen wonders?!). In the last number of years, Norwex has extensively expanded the accessories and tools available for the kitchen. Here’s one microfiber option I bet you didn’t list off: a dish mat. Did you know that Norwex sells a Dish Mat? This mat is constructed of three layers: Norwex microfiber, foam, and mesh. The mesh layer allows air to flow through, and separates the dishes from the wet microfiber, while the microfiber and foam soak up one and a half times their weight in water. Isn’t that fantastic? No more water covered countertops! This is great if you have a stone countertop that can’t have water sitting on it (those water stains are so much work to repair!). This performs like our other microfiber and dries quickly. Hang your dish mat to dry in between uses. If always left on the counter, it won’t be able to fully dry. That will cause mold to grow! That’s why this mat comes with a handy loop to make hanging up a cinch. Use the mat with the mesh layer on top, and the Norwex side on the bottom. It’s easy to get it mixed up and use it backwards, which means dishes are in full contact with the wet microfiber, preventing their dishes from drying quicker. Do a deep clean of your mat if the white coloured mesh gets stained from your well water, or if you’ve forgotten to hang it to dry between uses and it’s become musty smelling. It’s not just for the kitchen! Don’t be limited by the name of this mat. It’s not just for dishes! Ever think to use it as a baby changing pad? Absorb pee accidents during changes without doing a thing! Yup. This super absorber comes in handy for that! Another alternative use for it is under the water dish for your pet to absorb water spills. Surprised and amazed right now? Who knew!? 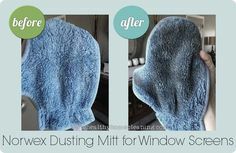 I feel like I say that all the time with Norwex products: ‘Who knew?! What a great idea!’ I love how versatile these products are! Get your dish drying on with this water-sucker, and happy cleaning! Norwex Bottle Brush and Extensions: A Review Did You Know That Norwex Sells Green Dish Soap? Hard Water: Where Does It Come From and How Do I Clean Up After It? 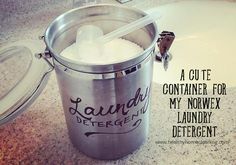 Norwex Dishwasher Detergent Review Did You Know Norwex Makes A Kitchen Scrub Cloth?